So, feeling terribly left out by my absence from the ELI Annual Meeting (hi everyone! ), Gus Goldkey decided to crash the NMC’s session on Second Life. Alas, I burned 45 minutes getting the technology in order, and when I arrived realized that there was no session audio. Most attendees were sitting, staring peacefully ahead… backchannel chat clearly responding to the live session that I was missing. It kind of felt like a Quaker silent worship meeting. When things were wrapping up, Gus jumped onstage and started screaming like a maniac, just like I would have done had I been there in person. The other attendees (perhaps fearful, perhaps unamused) did not respond, they just ignored me, again, just as if I’d been there! A bit comical. But not as comical as being positioned as an SL booster, as last Christmas I wrote a short press release for UBC’s Public Affairs office on the theme of “The Next Big Thing.” Others here at the University wrote on progress in personalized drugs, biofuel, and animal emotions. The best I could do was point to the growth in 3-D immersive environments. On the one hand, I was worried about piling on to the hype. Then again, I couldn’t think of any other area in online education that had advanced so much in 2006, or was more likely to grow in 2007. Plus, my experience with the NMC Regional Conference had convinced me there was something there worth paying attention to, hyped or not. So I put my misgivings and laughable lack of expertise aside and wrote the damn thing. And in terms of the stated objectives, the piece was received fairly well. I was interviewed a few times, and I think the Public Affairs people must be pleased by the media attention generated by the initiative. The piece has gotten some surprising readership — it was published in a UBC newspaper, and today it’s featured on the UBC homepage (I see they came to their senses and put something else up)… so a lot of people I know who normally don’t care what I do have seen the piece and asked about it. I would be remiss if I didn’t throw a shout-out to Northern Voice co-organizer Darren Barefoot’s new buzz project. I remember him mentioning his intention to launch Get a First Life at an NV planning meeting a couple months back, and thought it was a clever idea, but must admit the execution is even funnier than expected. I think the dude is gonna sell a lot of t-shirts. And it looks like the response has been amazing (“it’s been Dugg, Boing Boinged and TechCrunched in the past 24 hours” — it’s even been Infoculted). And kudos to Linden for an entirely sporting and reasonable response. Now that Mr. Barefoot has re-asserted his star blogger credentials, I should note that Mr. Big Shot is leading a session at Northern Voice entitled “Why We Blog“… I can testify that he’s at least as sharp and amusing in real space as his virtual presence might suggest. He’s got a survey up, and is dangling fabulous prizes. 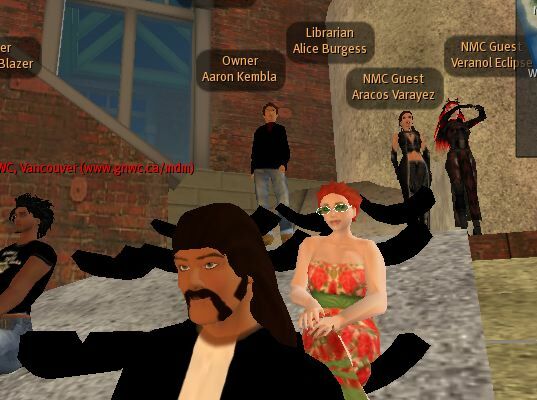 Oh yeah, there’s a virtual worlds session at Northern Voice too. Sorry I missed seeing you in the audience, Gus. But there *was* session audio, was streaming it from Atlanta, and those quietly relaxing folks reported hearing it. There was a it of cognitive overload to interact with both audiences, so sorry if we did not make it a prize winning experience. I was saddened to miss this SL event today. especially after the last week of flying around pimping the crap out of my avatar. hmmph. Still, there is at least one other second life edu party this week, perhaps worth considering. Alan, did not mean to imply that your efforts were deficient in any way. As I mentioned, there were screwy things happening on my end. The weird thing was, I was getting some sounds (typing, shuffling, the occasional laugh), but not the source stream. Jason — you’ll notice a similar link in the image posted above — my own subtle plug. I look forward to seeing yer new avatar. And keep stoking that hype machine dude!